You deserve the best in luxury. The best in performance. The best new technology. The best safety. You deserve the 2018 Audi A4. It has superior features in all the most important categories when compared to the 2018 Mercedes-Benz C300. Drive the pinnacle of luxury sedans today at Audi Oklahoma City. Make the road yours in the 2018 Audi A4. It comes equipped to lead the pack with its 252 HP turbocharged 2.0L engine and leave the competition, like the Mercedes-Benz C300, in the dust with a 0-60 MPH of 5.7 seconds. Plus, the 2018 Audi A4 gives you total control of the road thanks to available quattro® all-wheel drive and Audi drive select. Audi drive select lets you choose from 4 driving modes; comfort, auto, dynamic, and individual, to ensure that every drive is different. The 2018 Audi A4 doesn't just excel at performance - it excels at providing cutting-edge technology as well. The available Audi virtual cockpit is one such technology. It elevates your driving experience with a full digital 12.3-inch instrument panel with customizable information displays like audio, navigation, including accessing Google Earth™, and more. This technology is exclusive to Audi, you won't find it with competitors like the Mercedes-Benz C300. Keep peace of mind when you drive the 2018 Audi A4, because it received a 5-Star Overall Safety Rating from NHTSA! It keeps you safe with some of the best available safety technology, so you can focus on what really matters - hitting all the corners in your 2018 Audi A4! When it comes to choosing the right luxury sedan, there's really no comparison. 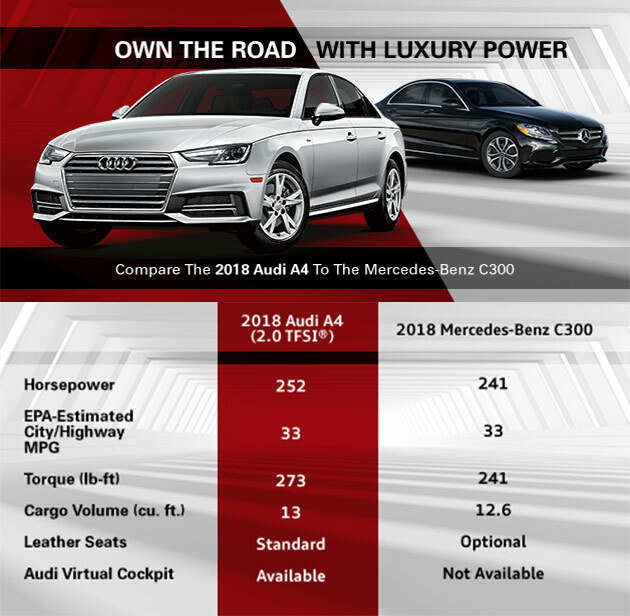 Discover how the 2018 Audi A4 leaves the competition behind when you visit Audi Oklahoma City today!